July 04, 2007: Lynn Smith-Lovin made her flight over our watershed a short while ago, and here is her report: The article in the Star today about the San pedro flow reminded me that I had meant to send out a "water report" to any interested folks. The flow in both Hot Springs and the Middle san Pedro is about as low as I can remember it. The flow stops well short of the Three Links boundary....reappears briefly behind the Mason place for about half a mile....then nothing more until the Smallhouses. In Hot Springs, the stream is dry until below the conjunction of the two major branches just below the pipeline crossing. It is running from just below there through the narrows, but dries up almost immediately after. The cottonwoods in the Canyon are turning yellow at some spots (notably where the side canyon at the end of Soza Meza comes into Hot Springs)....don't know if this is a normal reaction or a serious problem with their health. All of the tanks are obviously dry, but there is a muddy patch in the Red Tank, indicating that it had some water untill fairly recently. May 7, 2007: NOAA reports that, for Tucson, "Overall... the average temperature of 68.6 degrees was 2.6 degrees above normal and ranks as the 20th warmest April on record." This comes as a surprise to some of us, both in Tucson and in Cascabel, who have commented that April has seemed overall unusually cool. Apparently, global Warming has accustomed us to new standards for April, since the Elliott Weatherstation (see it on our Weather frontpage) also indicates an average temp. very slightly above the 23-year normal, but Harold Elliott also points out that April rainfall was also slightly above normal for his station. April 27, 2007: Harold Elliott reports that our March rainfall, at .87", was slightly above the normal March reading at Elliott's Weatherstation (.78"), but so far our Winter Rain Season (October through May) total as of the end of March is 3.92", while the normal for this time is 5.82". Our strong Summer rains last year (reported below) led to an unusually persistent flowing of the San Pedro River through Benson and points northward for much of the winter. September 07, 2006: Between our northernmost river Weatherstation (Elliott's) and our southernmost (the Clayworks), July rainfalls registered between 5.5 and 6.6 inches. Most of that occurred during the last 6 days of that month (which also saw very heavy rain in some other San Pedro River Valley locations at that time, as described below), and this was reflected in the San Pedro River flow volume, which rose quickly on July 27 to very full at the Clayworks and then remained strong throughout the entire month. August rainfall was considerably less in both locations (3.03" at the Clayworks, only .61" at Elliott's), but river flow declined only toward the end of the month, then dropped continually early in September. The river has risen substantially again with our latest rains beginning September 03, so it has run almost constantly in our area for nearly a month and a half. August 10, 2006: Daniel Baker reports: "I came back out to Cascabel [the evening of the 9th]. It was rather a challenge getting in on the Cascabel Rd., especially on the stretch north from the LDS church in Pomerene. It was flooded a foot deep for over a quarter mile and lots of cars stopped, but I made it through. Kelsey wash was not safely passable, so I turned back to visit with Ralph and Kathleen Waldt [Three-links Ranch] until about 8:30 when it was finally down enough to make it across. Today I drove into [Hot Springs] canyon to inspect the impacts. HSC had clearly run its hardest yet with the channel bed scoured to a wider width and banks under cut at the crossing. I did a little shovel work to make it across. It appears that all the flow was from upstream. [That is, not from lower-canyon sidewashes.] I heard a report from Ralph that the Muleshoe Preserve had 3" of rain in an hour, which was the likely source of the flood that caught the fellows down on the Cascabel Rd. However, there was not any indication of significant impacts outside of the wash, so not heavy rains locally. The wash changed channel again above the Windmill and back to the steeper sinuosity" [it had before the July 2003 local downpours which brought big fans of sediment down from the local sidewashes]. In order to appreciate the value of monitoring the San Pedro River flows on a fairly continuous basis during these stormy periods, see this link: Early August 2006: San Pedro River Flow at Redington Bridge. August 02, 2006: Harold Elliott reports that 6.59 inches of rain fell during the month of July at the Elliott Weatherstation, just breaking the old (23-year) July record of 6.54 inches set in 1990. August 01, 2006: The Muleshoe Preserve report just below is probably accurate. Charlie Thomas reports receiving 6 inches of rainfall at the San Pedro - Paige Canyon confluence during the storm; Daniel Baker says La Margarita received about 5 inches, and Hot Springs Canyon " ran so full and furious that I was not able to cross for two days to check on the sojourner up at the strawbale. Miller [McPherson] was gracious enough to check the signal by plane." Daniel finally waded across the Canyon yesterday on foot to pick up the sojourner, and they had to wait until late in the afternoon after the mid-day crest had fallen to walk back across "the still fast flowing stream" by foot (and were forced to leave behind the sojourner's gear). Daniel reports that the roads in Cascabel vicinity are generally passable, but not the road to the Windmill, which is blocked at Vince's crossing. Concerning the reported high rainfall at Aravaipa: Barbara Clark heard that there has been considerable flooding at Dudleyville, with a substantial house trailer brought down from the Aravaipa Creek area and caught under one of the highway bridges. She says that portions of the Cascabel Road north of the Hot Springs Canyon confluence are dangerous. According to Tom Orum, apparently the Soza Mesa overflow came down again into El Potrero. July 31, 2006: Since the beginning of this latest storm on July 27, rain accumulation at the stream-flow station near Benson registers 2.75 inches; at the Aravaipa Creek confluence, 15 inches?! At the Muleshoe Preserve station, 6.32 inches?! July 29, 2006: Writer of current SE Arizona "Forecast Discussion" says (as of 3:10 am), "A series of disturbances [rotating around] an upper level Low located over west central New Mexico... will result in numerous showers and thunderstorms across southeastern Arizona this weekend.... For the fourth night in a row it has been another busy overnight period... which in my 12 years in Arizona I can't remember nocturnal activity continuing for four days straight... Flash flooding anywhere across southeastern Arizona with the ground pretty saturated as a result of four days activity." San Pedro River flow at Redington Bridge rose to about 2700 cubic feet per second yesterday morning, dropped to a gauge height of about 9 feet at midnight last night, has now (6:18 am) risen again to about 1000 cubic feet per second. Click on Introductory Tour to the San Pedro River Valley and scroll down to the Teran Wash area for some images from July 27. July 10, 2006: See Casual Sightings for a further update with imagery. July 05,2006: Lynn reports: Last night there was an amazing storm that stretched about 150 degrees across the horizon E and S of us. Eventually we got .48 inches from it. July 02, 2006 : Lynn Smith-Lovin reports the airstrip got more than .5" yesterday, and flying over the area she saw that Sierra Blanca Canyon Wash had run all the way to the confluence with the River. Hot Springs Canyon now has water down to the Red Trail -- previously it was dry far up into the Canyon. This evening the airstrip has received 1/4", with some hail. July 01, 2006: This is nothing spectacular, but Harold Elliott reports that our June rainfall was 1.45". This is in fact about 5 times our average June rainfall, which is .24". That would seem to be a hopeful sign. see Harold's summaries for June -- which show that on only one other June during the past 23 years has the rainfall climbed over an inch. January 03, 2006: According our NOAA 2005 report for the Tucson metropolitan area, this past December has been the 12th warmest and 12th driest on record. For Northwest Cochise County, our Drought Level for 2005 is rated as "Moderate", while for 2004 it was rated as "Severe". Our Drought Outlook through March of this year is predicted "to persist or intensify." December 03, 2005: During the month of November, the Cascabel area received no rain whatsoever. As Harold Elliott observes, "Let's look at the bright side -- future Novembers won't be any drier than this one." October 29, 2005: NOAA predicts Warm and dry winter for our area. September 09, 2005: Harold Elliott reports that the month of July was the hottest month he has ever recorded at his Cascabel Weather Station (based on the average temperature readings), and that the National Weather Service in Tucson also recorded it as the hottest month ever. He reports his July rainfall as 2.69", all coming toward the end of the month, as against an average of 2.79", but notes that "People south of me a few miles got a lot more rain than I did during a big storm on Wed. 7/27. Les Helfrich got 2.5", Jane Matson got 2.3", and Charlie Thomas got an amazing 3.5"." For August, he reports significantly below-average rainfall -- 1.89" against an average of 3.19". During August and September so far, the San Pedro Streamflow Station at Redington Bridge has recorded significant flowing (intermittently) from August 10 through 20, then two pulses August 25 and 26, and now two more pulses September 8 and 9. July 28, 2005: At about 6:30 this morning, the Cascabel Road between Teran Wash and Hot Springs Canyon was filled with swarms of flying ants, who have waited for the good rain to emerge for their mating dance. Two hours later, they were no longer swarming but at spots along the road large brownish masses of ants continued to swarm on the earth. See Casual Sightings for more details. A driver coming from the north said "It's like this all the way to San Manuel", meaning lots of rock flows across the road and places where small washes have cut sharply into the road. (The grader was out by 10 am or so, however, working on the problem spots.) Inland and upland, the land appears increasingly dry, so the big rain seems to have been confined mostly to the vicinity of the River. Charley Thomas said their lands (near the confluence of Hot Springs Canyon with the River) got 3 inches just yesterday. July 27, 2005: At Barbara Clark's Clayworks near Teran Wash, the rain gauge showed 2.18" for the Monsoon prior to today, with significant rains on July 15, 17, 20, 23, and 24. Today, a substantial monsoon storm hit the Cascabel area, and all the main washes ran across Cascabel Road for a time. The Kelsey Wash and Teran Wash ran enough to block the travel of ordinary-drive vehicles, Pool Wash had run across the road substantially at some earlier time, and Sierra Blanca Wash was running. Softer rain has continued into late evening. By evening Barbara Clark registered 1.3" for today. Another gauge in Lower Hot Springs Canyon, checked this same evening, showed 3.5" for the entire monsoon so far. the two totals as of this evening are very close (the Clayworks monsoon total is 3.48"). February 14, 2005: Charlie and Jeannine Thomas report that the Paige Canyon Wash has flowed so strongly that it blocked the San Pedro River near the Thomases' place. On Saturday, the San Pedro was flowing upstream, as a lake formed at the Confluence, and this lake has lasted into Monday. February 13, 2005: After a January rainfall at the Elliott Weatherstation of 2.02" (compared with a normal of 1.24"), we have had a number of days of February rain, culminating with this latest storm that has again started a flow along the San Pedro River at the Redington Flow Station, which shows a spike from zero up to about 450 cubic feet per second beginning about midday February 11, and then another up to about 600 cfs February 12, slowly declining to about 500 cfs today. David Omick and Pearl Mast have hosted a Presbyterian college group at the Hot Springs Windmill, and they report a total of 1.3" rainfall there since Wednesday (the ninth). Hot Springs Canyon ran too strong to cross on the 12th, but passable now at the crossing below the Airport. The Presbyterian group had some adventures while out on solitary retreats, but their vehicles left without harmful incident. Tom Orum and Nancy Ferguson took relatives up the Pool Wash Road, and report more than 2" of rain at both uplands rain gauges there since the last reading taken on January 22. Neither the Diversion Tank nor the Trail Tank had significant water, indicating how thoroughly the rains have soaked in over the uplands. January 04, 2005: Sorry to say, we have neglected this page during the past Fall, but here is a current report of the latest storm system, and we will make more effort to keep current from now on. Our Redington Flow Station showed a flow beginning after midnight today, which rose up to about 440 cubic feet per second at its peak (since declining). Harold Elliott just reported to me from his Weather Station at 3:42 pm that January's total as of that moment was .93", "and it is raining as I type", he says, so we can be encouraged with the 2005 situation so far. We will also be providing an update of this past rain year's rain (compared with several previous years) at all our gauges, in the near future and will notify you on this page..
July 16, 2004: Rainfall! Pat Corbett in Cascabel (El Potrero) reported 1.1" of rain on July 14 (Lower Hot Springs Canyon also more than an inch). Now the USGS Redington Flow Station shows two spikes: from zero to nearly 500 cubic feet per second near mid-day on July 14, declining to zero by mid-day July 15, then a much larger spike (to over 2000 cu.ft/sec) beginning late last night and into early morning today. Daniel Baker reports that the Clayworks at Teran Wash confluence received 1.7" in a little more than an hour yesterday afternoon -- nickle-sized hailstones included. We'll give a more detailed update shortly. July 03, 2004: Harold Elliott reports Cascabel rainfall for June as .04", compared with an average of .29", with an average high temperature of 104 and an average low of 61.1 (both of the latter right at the 22-year average, but a little cooler than the past 4 years). June 04, 2004: Our S-J rainfall for May was Zero, though as Harold Elliott has reminded us, this has been true for 11 years out of the 21 that his weatherstation has blessed the Cascabel community -- the average for the month is just .29". This past May was moderate in terms of temperature -- slightly above "normal" but "Degree Days" of heating were just 4. May 01, 2004: Harold Elliott reports that April rainfall at the Cascabel station totalled 1.09", more than twice the normal .5". April was also somewhat cooler than normal (see the Elliott Weatherstation page for more information). April 01, 2004: Harold Elliott reports that March rainfall at the Cascabel station totalled 1.63", compared with a normal of .91", and that total rainfall for the calendar year so far is 3.68", compared with a normal of 3.41". However, the Winter Rainfall total (beginning October 01) remains somewhat below average (5.59" compared with 6.95"). Despite this, we have had sufficient rain to sustain a fairly good Wildflower season -- see this link for some examples. A computer glitch wiped out the March Climatological summaries, which Harold regards as unfortunate since he thinks this past March was one of the warmest on record. (We know that Tucson's March was indeed the warmest on record.) Jimmy McPherson reports from the Cascabel Airport a total of .33" of rain for today. It seems the desert is a never-ending source of wonder. The last thing I expected on waking this morning was to be witnessing fish flopping in the wash of HSC this afternoon. From mid-morning until early afternoon, as a light but steady rain fell, we huddled under our ramada, hosting a small group of folks from Tucson. Finally, 4 tenths of an inch and some hours later, the rain lifted and the sun appeared. We walked back with them across the wash to their vehicles and saw them off, then took the goats out for awhile. On returning back across the canyon to our place, we could see that the wash had run in our short absence, but only as far down canyon as our path and was now receding. We followed the rapidly retreating water upstream for several hundred feet, passing many small fish, 1 1/2 to 2 inches long, flapping, gasping, dying in the moist sand, marooned by the disappearing water. We "saved" a few, carrying them a few feet further upstream to water, whereupon they would swim downstream only to be marooned again. I'm still reluctant to wash the smell of fish off my hands. How many coyotes, coatis, ringtails, raccoons and their kin will feast on fish tonight as one species' tragedy becomes another's blessing? March 04, 2004: Writing as of noon on this date: Harold Elliott reports that at his Cascabel Weatherstation, as of 11:09 AM this morning, .93" of rain has fallen since the beginning of March; David Omick reports that in Hot Springs Canyon, more than an inch fell since yesterday. Harold says that the February rainfall total was below average but "respectable", and since our March average for Cascabel is .91", we are already above the average for this month! This is good news. Harold also comments that this last February was the coldest (48.3 degrees average temperature) since he started keeping records in 1983. March 01, 2004: The last week of February brought two good winter rains to Saguaro Juniper lands -- totals are not yet available, but the ground is very damp and spring annuals are coming up. Many perennial grasses show new green at their bases. 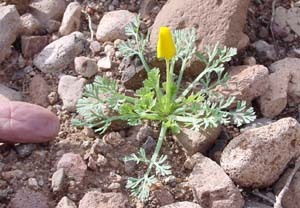 Mexican Poppies have been blooming for more than a week already [note that McGinnies' Schedule shows them beginning around the middle of March for the Sonoran Desert], Evening Primroses too, and Desert Marigolds are on the verge of blossoming. The Fremont Cottonwoods are greening up in some parts of Hot Springs Canyon (see photo toward the bottom of the page of this link). February 01, 2004: Despite our January 25 report (just below), the Elliott Weatherstation reports a total of .89" of rainfall for the month of January, below the January average of 1.21". NOAA currently predicts the probability that in our area drought will "persist or intensify" through April 2004. January 25, 2004: After a good November in our Winter rainy season, December returned us to drought conditions -- .38" at Elliott station Cascabel compared with a normal of 1.29". However, January is looking somewhat better in light of our late-month rains: the Elliott average total for this month is 1.21". Today, from the web page we can see three separate pulses of San Pedro water flow at the Redington Bridge, more or less coinciding with several brief bursts of substantial rains in Tucson.. Earlier in the week, there was a Redington San Pedro pulse on January 23 and another on January 24. Pearl Mast reports from Hot Springs Canyon that about .5" was received the 23 and 24, and something over .1" today. December 04, 2003: Harold Elliott reports that for the month of November -- for the first month in quite a while -- our rainfall at Cascabel was well ahead of normal. This was due to the extended period of light rainfall throughout our region from November 11 to 13, which left a total of 1.12" at Harold's station in Cascabel, and (for example) 1.17" at one private station in Tucson. July 27, 2003: Daniel Baker reports that Friday evening (July 26), over the space of an hour or two, a violent Monsoon storm dumped an inch and a half of rain and hail on Hot Springs Canyon Wash and drainages. With the soil compacted and the dearth of vegetation following a long period of very little rain, extremely heavy runoff swept down the slopes and through the canyon, flooding the wash from bank to bank and blowing out fences and depositing large amounts of mud and silt (both protruding out from the side washes and along the main wash where the channel is somewhat changed). The Sierra Blanca uplands situation described yesterday may now be somewhat altered -- we will provide fuller reports shortly. July 26, 2003: Yesterday I (RNH) went up the Pool Wash Ridge Road to read the rain gauges, to find the total Monsoon rainfall amounts on the Sierra Blanca uplands very disappointing, the land looking extremely dry, the vegetation very stark. (A few agaves were blooming, the ocotillo all dry sticks, hardly any sign of green grasses). The Cow Camp reading since March was .226". Last night, however, the storm that came through Tucson also swept over parts of the San Pedro drainage. El Potrero caught some .80", and the washes running down from Soza Mesa flooded the El Potrero slopes, washed out several of our grazing lease fences, and left substantial mud deposits in El Potrero. If you consult the San Pedro River flow charts (go back to the main Weather/Climate page), you will see that the river at Tombstone showed a strong flow spike yesterday evening, and at Redington a similar spike near midnight. So a number of washes flowed. July 15, 2003: Note that the San Pedro River flow at Redington shows two sharp spikes: One beginning early morning on July 13 and one beginning mid-morning today. July 12, 2003: 8:20 pm: Miller reports that yesterday's rain total at the Cascabel Airport was .16" -- winds were extraordinary, with a maximum burst of 88 mph and sustained winds at 70 mph. This evening's storm had 67 mph maximum winds and .57" of rain. Tucson of course also got heavy rain for nearly an hour. So finally we have received a substantial Monsoon rainfall in some parts of our area. Also heavy rain in the Catalinas, finally. July 11, 2003: 9:00pm: Miller McPherson reports from the Cascabel Airport that a wind gust of 80 mph struck the weatherstation earlier this evening, with sustained winds running in the 60s for extended periods of time. At last we have water vapor hovering over Cascabel -- at 8:30 pm tonight, NOAA/GOES-10 satellite imagery shows a cell of dense water vapor moving over the Cascabel area, while "Storm total" rainfall of between 1 and 1.5" is shown for some part of the Cascabel area. But this must be very spotty rainfall -- Miller reported only very light rain by 9:00 pm. A longer report will follow. June 3, 2003: Harold Elliott's May report concludes the "Winter Rain Season" (October through May) for the Rain Year 2002-2003. As you will be able to see by consulting Harold's summary, his Cascabel station received less than half the normal rainfall for this Season (only 3.71 inches, against a normal of 7.98). The only month of the six in which we received normal rainfall was February (exactly "on normal" -- 1.31"). March, April, and May were well below normal. April 2, 2003: According to Harold Elliott's latest monthly report, his station received .49" during March, compared with a normal (average) of .93" -- which means we got only a bit over half of our average rainfall. The U.S. Drought Outlook Monitor shows our area expecting "Drought continues, some improvement" through June, the "improvement" is of course reflected on our lands -- many grasses are greening up, we have a significant wildflower display -- but this March rainfall was definitely a disappointment. March 2, 2003: David Omick reports that their location near the HSC Windmill received .25" from yesterday to today. In the storm earlier last week, they had .35". He says lots of annuals are coming up. Tom Orum reports that early today, the SBS-Corbett Willow Spring fence-building team went up to the Cow Camp to begin their workday, but were caught in so strong a downpour that they had to give up for the day. (We'll read that rain gauge later this week.) So March is off to a good raining start on our lands. March 1, 2003 : Harold Elliott just submitted the February weather summary for his weather station (along with his update for the 2002-03 rain year), which records that February is the first month of this current rain year in which Cascabel has received an average amount of rainfall (1.31"). February 26, 2003: San Pedro River is running both at Tombstone and at Redington -- see the graphs on the main weather page. February 16, 2003: Reports from El Potrero and the Windmill: almost an inch at the former, .8" at the latter, both during the last three days. February 15, 2003: Additional rainfall info: Elliott Weatherstation (north side of Cascabel, on the first terrace) for February: .75". Thomases (San Pedro floodplain at Paige Wash confluence): .5". David & Pearl at the Windmill: .9. So clearly the Airport stands out as an exception at this time. February 14, 2003: SJ Airport weatherstation reports to 2.08" for the month of February -- according to Harold Elliot's summaries by month for their Weatherstation (a couple miles NW of the airport), the average for February is 1.31", so maybe finally we've gone above normal for this current rain year (October 2002- September 2003). But hold on -- some other S-J'ers are saying only between .5 and 1 inch -- maybe our new weatherstation still has some flaws. February 13, 2003 : Good news! As of 7:30 am today (Thursday), the SJ weatherstation at the Airport has received more than an inch of rain this week. February 04, 2003: Yesterday, David Omick and Pearl Mast reported receiving two inches of rain at their Windmill area location in Hot Springs Canyon; unfortunately this rain was received in a plastic bottle mailed to them by friends in Oregon as a joke. (One station in HSC got .10" during the whole month of January.) The latest "U.S. Seasonal Drought Outlook" page (released Jan. 16) predicts "continuing improvement" for our area, but the latest "U.S. Drought Monitor" (released Jan. 28) indicates "severe drought" for our area (see our links on the main Weather/Climate page for these pages). January 09, 2003: Despite our lack of rain so far this month, the National Oceanic and Atmospheric Administration (NOAA) tells us in today's El Nino report that "mature El Nino conditions" (as indicated by elevated sea surface temperatures in the Equatorial Pacific Ocean) are now in place and will remain so until March, which should bring wetter than average conditions to our area during this time. (See our link to "El Nino/Southern Oscillation diagnoses" on the main Weather/Climate page.) We can only hope. December 31, 2002: According to the Elliott Cascabel Weatherstation (whose nearly 20-year summaries and current reports we will soon be placing on our main weather page), our Cascabel rainfall during the month of December was 1.12 inches, compared with a normal rainfall of 1.34 inches. This is moderately encouraging after a difficult year. The total rainfall at the Elliott Station for 2002 was 7.37 inches, compared with a normal (as I -- RNH -- recall Harold Elliott saying, approximately) 16 inches. We will soon have three different sources of weather information placed on our S-J weather/climate page: the Elliott station, the Talley station, and the new Airport station run by Miller MacPherson and Lynn Smith-Lovin. November 25, 2002: Despite our lack of rain during the month and a half since our last event (see below), the latest "Seasonal Assessment" in the "U.S. Seasonal Drought Outlook" as of November 21 (see our link to that page, above back) states that "drought improvement is expected across the Southwest and into the Central Plains" during the months between December and February. Let's hope this projection proves right. September 14, 2002: Within the past week, some Saguaro Juniper lands received more than 2 " of rain, while others got about an inch. Watertanks all now have some water, with the Diversion Tank filled to almost overflowing. Ocotillo greened up everywhere, and the creosote bush on the terraces has gone from an overall amber-color to bright green with specks of blooming yellow. This late Monsoon moisture is definitely a blessing for living things. Of course, on Sunday, winds were blowing from the East, and the sky was clear almost everywhere including over the Galiuros. But at noon and later, tiny clouds began forming directly overhead in Hot Springs Canyon, first as almost imperceptible gray hazing of the sky, then threadlike whitening wisps, finally clustering and expanding into substantial puffs with bright white tops and dark undersides, moving slowly westward toward the Rincons. So our new moisture was already on its way up, up, and away, as evapotranspiration again (as usual) exceeds precipitation in our area. Subsequent examining of our uplands showed none of the Watertanks holding water with the exception of the Red Tank (which received a significant though not large input). In the Pool Wash Ridge area, we found that some perennial grasses were greening up significantly in some places. Soil was damp from the surface down to well over six inches. Overall, of course, the land remains pretty dry and vegetation has been much stressed, but this last rain has to be considered a blessing for these lands.